These strain gauges are not directly bonded onto the surface of the structure under study. Hence they are termed as unbounded strain gauges. The arrangement of an unbonded strain gauges consists of the following. Two frames P and Q carrying rigidly fixed insulated pins as shown in diagram. these two frames can move relative with respect to each other and they are held together by a spring loaded mechanism. A fine wire resistance strain gauge is stretched around the insulated pins. The strain gauge is connected to a wheat stone bridge. When a force is applied on the structure under study (frames P & Q), frames P moves relative to frame Q, and due to this strain gauge will change in length and cross section. That is, the strain gauge is strained. This strain changes the resistance of the strain gauge and this change in resistance of the strain gauge is measured using a wheat stone bridge. This change in resistance when calibrated becomes a measure of the applied force and change in dimensions of the structure under study. 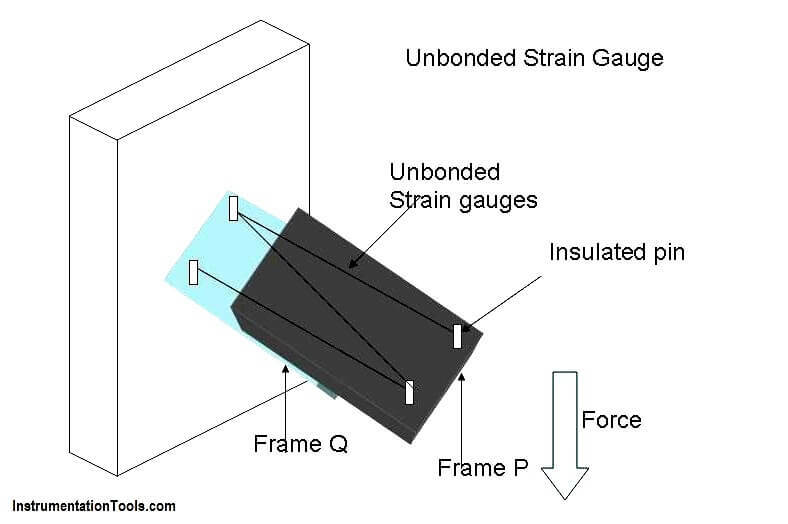 Unbonded strain gauge is usedin places where the gauge is to be detached and used again and again. unbonded strain gauges are used in force, pressure and acceleration measurement. The range of this gauge is +/- 0.15% strain. This gauge has a very high accuracy. How to Stop Cyber Attacks on Control Systems ?